European nations and Canada pushed back against accusations they don’t spend enough on defense after receiving a scolding from U.S. President Donald Trump. Trump, who travels to Brussels next week to attend a potentially testy North Atlantic Treaty Organization summit, sent letters to several allied nations calling on them to increase their military budgets. Italy, Germany, the Netherlands, Canada and Spain also confirmed receiving a version of the letter. The New York Times, in a report Tuesday, said it was sent to Belgium, Luxembourg and Portugal too. One NATO country government official, speaking on condition of anonymity ahead of the July 11-12 summit, said they understood that all members of the bloc received a letter. BRUSSELS --- The Trump administration has included Britain, Washington’s most loyal battlefield ally in the wars in Iraq and Afghanistan, among countries being sent letters rebuking them for spending too little on their militaries. Secretary of Defense Jim Mattis threatened to replace Britain with France as its main military ally unless London ramps up its defense spending, in a letter sent on June 12 and reviewed by Reuters on Tuesday. 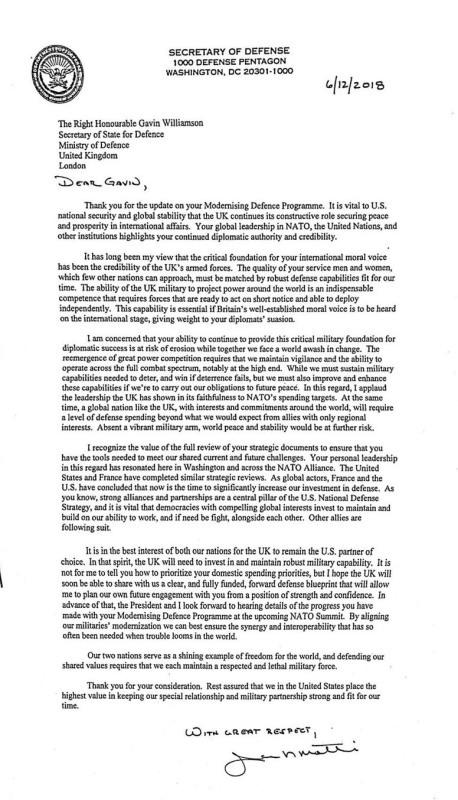 The strongly-worded letter from Mattis to Britain’s Defence Secretary Gavin Williamson noted that Britain was one of the few NATO allies that already meets the alliance’s target of spending 2 percent of economic output on the military. But it said that was not good enough. 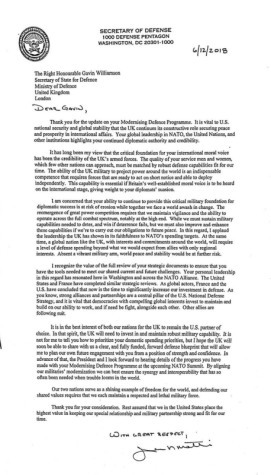 Britain’s global role “will require a level of defense spending beyond what we would expect from allies with only regional interests,” Mattis wrote.